The Geminids — “the King of Meteor Showers” — will rain down around 100 to 150 multi-colored slow-moving streaks per hour this weekend, visible from anywhere, but the best views will be for those in the Northern Hemisphere. The show will peak over the night of Sunday, December 13 — between midnight and morning with the highest activity between 2 and 3 a.m. There should be some meteors visible already at sunset, though. 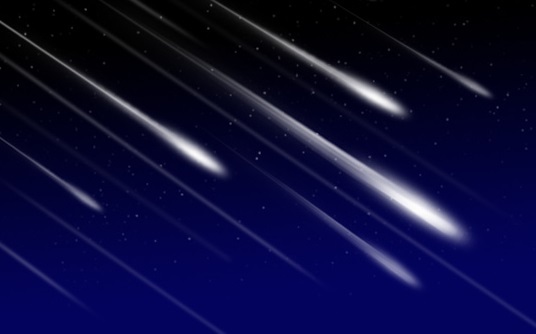 While the meteors will radiate from the southwest, there is no particular part of the sky where viewers need to focus their attention because the shower will be so high. The Gemenids are famous not only for the frequency of meteors, but also their slow movement and the varied colors which are produced by the different chemical compounds burning in the sky. The Gemenids are a relatively young shower — first observed 150 years ago. They originated from the 3200 Phaeton asteroid — one of only two major showers not originating from a comet. “The law we identified is brand new; such a law would have been impossible to identify 10 years ago as we simply did not have the technology to track pedestrian crowds at a large-scale,” Dr Ioannis Karamouzas, Research Associate at the University of Minnesota’s Department of Computer Science and Engineering and first author of the report, told The Speaker. “Nowadays, though, in the era of big-data there is a plethora of publicly available human crowd data. 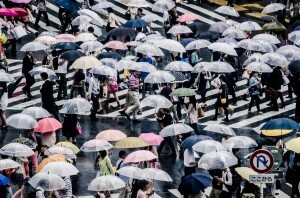 By analyzing such data, we found that, unlike particle-based interactions, the interactions between pedestrians are anticipatory in nature,” Karamouzas told us, referring to previous models that had attempted to predict crowd behavior with data based on repulsive particles rather than humans. Karamouzas and his team have discovered a universal parameter based on single variable that explains crowd movement. Karamouzas elaborated on the types of crowd phenomena that could be explained by the new law. “This law is broadly applicable as it consistently holds across different crowd settings; we analyzed both sparse and dense human crowds and found that pedestrian interactions follow the same power-law relationship. Our law has allowed us to gain a better understanding into how human behave and interact in a crowd. Karamouzas also explained how a law could so simply cover such range in speeds, densities and situations. The law could not have been found in the past, due to the complexity required of the analysis. Karamouzas went into detail about how his team found the law. “We turned into a large collection of publicly available pedestrian datasets that are nowadays available thanks to the advances in automated tracking and computer vision,” said Karamouzas. “Overall, we analyzed six datasets consisting of students walking in college campuses, pedestrians interacting at commercial streets, and a few controlled experiments where participants navigate through narrow bottlenecks. Previously, there had been formidable challenges facing researchers who wanted to find an accurate and general rule for pedestrian behavior. The research is considered to hold new promise for improved public architecture and spaces, the failings of which in the past have caused deaths. “First of all, the nice thing about our newly identified law is that it directly implies an accurate model of simulating crowd flows. And through such simulations, we can design safer buildings as well as improve the efficiency of existing facilities–e.g., better egress times at a stadium. Furthermore, our novel way of analyzing crowd data and directly measuring the “interaction energy” between pairs of pedestrians opens interesting avenues for future work. For example, we would like to analyze crowd data from mass gatherings, such as concerts, and see how the interaction energy can be used to identify critical areas preventing the likelihood of crowd disasters–like the Love Parade in 2010). Karamouzas commented on what he thought may be the most important thing for readers to understand of the research. “The main take-away message is that a lot of the complexity of pedestrian interactions can be captured using simple mathematical equations. The universality of how pedestrian respond to each other is really surprising, and understanding this can lead to more accurate simulations, safer building designs, and shed some light into the anticipatory nature of human interactions. 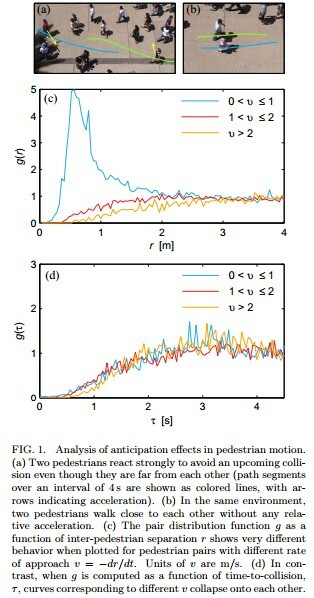 The report, Universal Power Law Governing Pedestrian Interactions, was authored by Drs. Ioannis Karamouzas, Brian Skinner, and Stephen J. Guy, and was published in Physical Letters Reviews last week. Agents positioned at two concentric circles have to walk to their antipodal points. 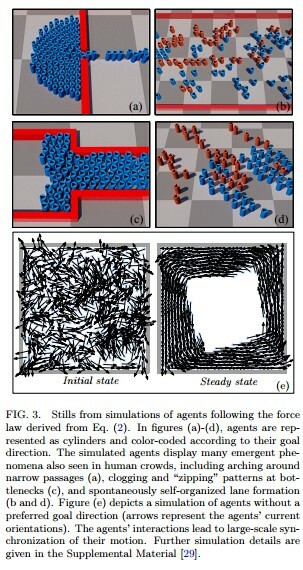 Self-directed agents form collective patterns. Bi-directional flow through a corridor. The development of a new metal matrix composite foam may tip the balance back towards metal materials in the construction of marine vehicles — in addition to offering heat resistance well beyond that of the fiberglasses common in the industry today. According to NYU engineers, the first lighter-than-water metal construction foam can withstand significant pressure and three times as much heat as fiberglass. 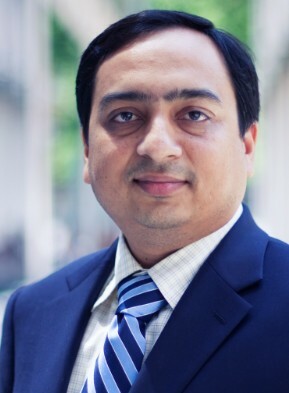 “This is the first time anybody has been able to achieve density of the composite lower than that of water to create naturally buoyant materials,” explained New York University Polytechnic School of Engineering’s Dr. Nikhil Gupta. The metal matrix composite is a magnesium alloy reinforced with spherical silicon carbide particles. The density — 0.92 grams per cubic centimeter versus water’s 1.0 – still allows the material to withstand 25,000 pounds per square inch of pressure before rupturing. Some of the strength of the material is due to the hallow particles embedded in the material, which absorb energy during a fracture. With different measures of spheres added to the matrix, various densities can be created. “The spheres are manufactured by our industrial partner Deep Spring Technology, Toledo, OH, USA,” noted Gupta, an expert in mechanical and aerospace engineering. Spheres were the shape of choice for the foam. “This company also has capabilities of manufacturing hollow particles of many other shapes,” said Gupta, who referred to two other types of particle shapes — made of silicon carbide [gray color] and alumina [white color]. The light-weight heat-resistant material is also expected to offer potential improvements in fuel economy for land transportation. The ability of metallic materials to withstand high temperatures is one of the main selling points, Gupta noted. “Some of the competing materials are polymer matrix composites, commonly known as ‘fiberglass.’ One of the limitations of fiberglass materials is that they cannot be used over 150 degrees Celsius because polymer will degrade or burn. 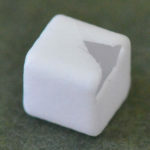 In addition, fire, smoke, and toxicity are concerns when polymers are exposed to high temperature. Magnesium and Magnesium matrix composites can be used up to about 500 degrees Celsius. 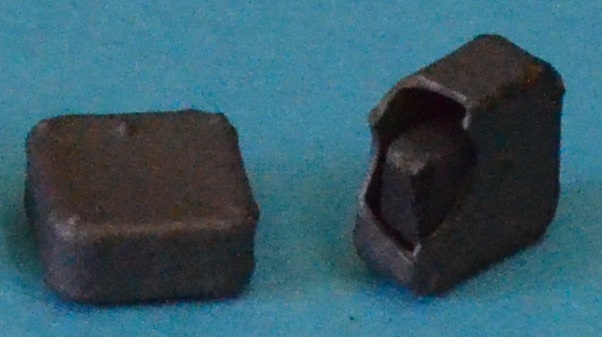 Automotive components such as pistons, connecting rods, exhaust systems and structural components can be made of lightweight Mg matrix composite materials. High temperature in many of these components prohibits use of polymer matrix composites. The technology may be put into use in prototype automobiles and boats within three years, as well as in amphibious vehicles developed by the US military, where currently the trend is toward other materials, although experts consider that the new lightweight product may again give metals a material advantage. “Weight reduction in transportation applications can help in reducing the fuel consumption,” Gupta told us. “In addition, the high energy absorption capability per unit mass in these materials can also help in making vehicles safer. However, one material cannot be used to make all components, we need to find the components that will benefit the most from these new materials. The report, “Dynamic Properties of Silicon Carbide Hollow Particle Filled Magnesium Alloy (AZ91D) Matrix Syntactic Foams,” was completed by Harish Anantharaman, Vasanth Chakravarthy Shunmugasamy, Oliver M. Strbik III, Nikhil Gupta and Kyu Cho, and was published in the International Journal of Impact Engineering.